[136 Pages Report] Micronized PTFE is prepared by irradiation or thermal decomposition of virgin PTFE or PTFE scrap. Direct polymerization under controlled conditions may also be used to produce low molecular weight PTFE micro powders. The micronized PTFE market has grown rapidly during the past few years and is expected to continue the trend in the next five years. The growth is mainly driven by the growing demand in the Asia-Pacific region. Asia-Pacific is the biggest market followed by North America and Europe, which together accounted for more than 90.00% market share in 2013. The U.S. is the biggest market for micronized PTFE, followed by China, and is projected to grow at a CAGR of 7.08% between 2014 and 2019. The European market is comparatively mature with a consumption growth rate well below the average market growth. Thermoplastic is the fastest-growing application segment of micronized PTFE growing at a CAGR of 7.04% between 2014 and 2019. This study aims to estimate the market of micronized PTFE in 2013 and project its demand by 2019. This market research study provides a detailed qualitative and quantitative analysis of the market. It provides a comprehensive review of major market drivers, restraints, opportunities, winning imperatives, challenges, and key issues in the market. The market is further segmented and projected by regions Asia-Pacific, North America, Europe and RoW, which are further segmented by key countries in each region. We have used different secondary sources such as encyclopedia, directories, and databases to identify and collect information useful for this extensive commercial study of micronized PTFE. The primary sources that include experts from related industries and suppliers have been interviewed to verify and collect critical information as well as to assess the future prospects of micronized PTFE. This research report segments the market on the basis of application and region along with forecast of revenue and analyzing trends in each of the submarkets. On the basis of application: The market is segmented on the basis of application segments such as inks, thermoplastics, coatings, grease & lubricants, elastomers, and others. Each application is further described in detail in the report with value forecasts for aforementioned applications. 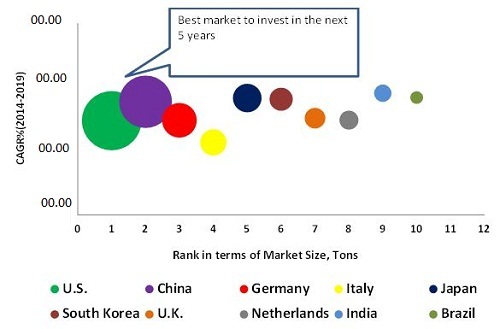 On the basis of region: The micronized PTFE market is segmented by regions Asia-Pacific, North America, Europe, and RoW; and they are further segmented by key countries in each region that include China, Japan, South Korea, India, the U.S., Germany, Italy, the U.K., the Netherlands, and Brazil. Micronized PTFE market is projected to reach $868.29 million by 2019, signifying firm annualized growth of 7.06% between 2014 and 2019. The micronized PTFE market has witnessed a significant growth in the recent years, and this growth is projected to persist in the coming years. Due to its characteristic properties such as wear and abrasion resistance, low friction coefficient, flame retarding properties, and tensile strength is used as additive in a wide range of applications such as inks, thermoplastics, coatings, grease & lubricants, and elastomers. The use of PTFE micro powders has been increasing over the years due to increase in the demand of high performance polymers that operate under extreme conditions of temperature and pressure. Currently, the Asia-Pacific is the biggest market of micronized PTFE, accounting for 38.00% of the total market size in terms of value in 2013. Among all the countries, the U.S. dominates the micronized PTFE market, which had the maximum market share of micronized PTFE in 2013. Thermoplastic is the fastest-growing application segment of micronized PTFE, followed by grease & lubricants having the small market size for PTFE micro powders. The European market is expected to show the lowest CAGR of 5.65% between 2014 and 2019. Growing innovation and developments in the micronized PTFE consumer industries for better products are directly affecting the rise in the use of PTFE micro powders. The excessive growth and innovation, along with industry consolidations, are projected to ascertain a bright future for the industry in the region. On the basis of application, the market is further categorized into inks, thermoplastics, coatings, grease & lubricants, and elastomers. The growth in application segment is primarily driven by growing demand from the Asia-Pacific region particularly from China. The major players of micronized PTFE include Shamrock Technologies (U.S.), E.I. DuPont de Nemours & Company (U.S.), Daikin Industries Limited (Japan), Solvay S.A. (Belgium), Micro Powders, Inc. (U.S.), and 3M (U.S.), Asahi Glass Co. Ltd. (Japan), Chenguang Research Institute of Chemical Industry (China), and Gujarat Fluorochemicals Limited (India), Shanghai 3F New Materials Company Limited (China). 5.3.3.1 Growing Grease & Lubricant Industry in the U.S. Figure 33 Thermoplastics & Inks Dominate the Consumption of Micropowders in the U.S.